London: Sphere Books Ltd., 1991. This is the Sphere Books Ltd. paperback edition of Talking God, the ninth book in Tony Hillerman's Navajo Mystery Series. The cover was designed by Lesley Howell. 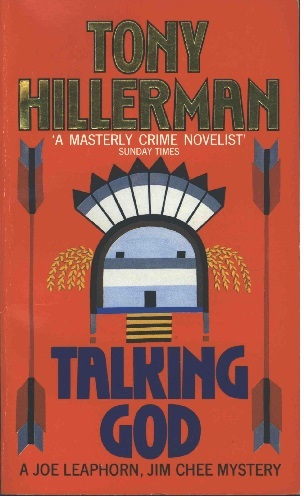 Unlike many Hillerman novels, a great deal of the book takes place in Washington D.C. rather than in the Southwest. This edition of Talking God is similar to another edition which was also published by Sphere Books Ltd. in the same year with the same cover but has a different ISBN number and different advertisements in the back. This edition also includes the Australian and New Zealand prices for the book in addition to its price in Pounds. Format: Paperback, 17.7 x 10.8 cm. Binding: Paper covers with full color graphic on front. Author's name is gold outlined in black and the title is in blue print. The spine is lettered: [vertical] TONY HILLERMAN TALKING GOD | [horizontal] [publisher's device] | SPHERE, printed on a red, blue, tan and brown vertically striped background.